The crozier represents that the monks are tied to the Rule of Saint Benedict under the Guidance and rule of the Abbot who holds the place of Christ in the Community (i.e. the Good Shepherd). 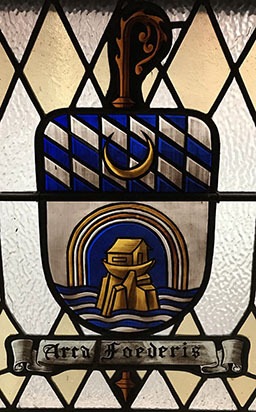 The shield is white topped with Bavarian blue and white diamonds representing the Bavarian Flag and hearkens back to the origins of St. Mary’s Abbey (The original Name of the Abbey) which was founded by the Archabbot of St. Vincent’s Archabbey who originally hailed from Metten Abbey in Baviaria. Within the shield is contained the Ark and the rock upon which the ark came to rest after the great flood of Noah’s time surrounded by receding waters of the flood. Above the ark is a rainbow representing the the new beginning of Newark Abbey after the tumultuous period preceding it’s re-elevation to Abbatial status. (The modern Abbey Logo also features a dove with olive branch) The commitment of the Monastic Community to the City of Newark is encapsulated in the motto of the Abbey “Arca Foederis” (The Ark of the Covenant).